I was just asked what I like about Disney World Resorts. The short answer is that I like almost everything. They each have unique themes and perks that add to our vacation. Other than staying at one of the Downtown Disney world resorts I can't imagine staying anywhere else. All of them have a different theme, pools, dining areas or restaurants and gift shops. Just as importantly they all have access to the famous Disney transportation. You can arrive at most of the Disney World resorts, park your car and never have to move it for the duration. Just go down to the bus area, get in line and you're on your way. 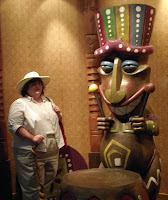 Here's a brief rundown of some of the Disney World resorts that I've visited. We've stayed twice in this value resort and have had good experiences both times. These are designed for the budget guest. 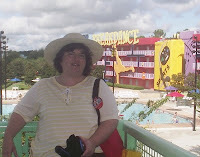 My article on Yahoo Voices tells more about my experience at Pop Century. 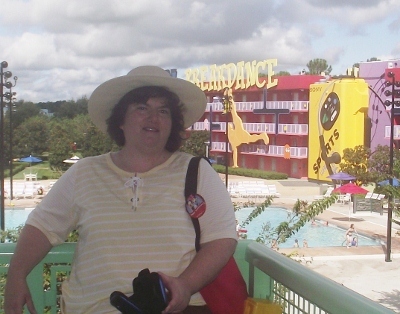 This is one of the Disney World resorts that is packed with charm. If you like to ride the monorial then you will probably enjoy the Contemporary Resort. It's upscale design and position on the monorail add to the charm. It's also one of the Disney World resorts where you can enjoy character dining. Our kids enjoyed seeing Chef Mickey in action. They'll always remember waving our napkins in the air to welcome him in. It is as the name describes. The Grand Floridian is on the monorail route and has all the grandeur of a southern mansion. 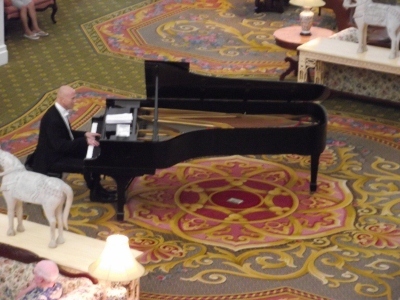 The day that we visited an excellent pianist performed in the main lobby. A spot for the brass band was on the second floor. It's possibly the only one of the Disney World resorts to have a spa, upscale retail store and a luxurious bath shop. Talk about charm! From the moment you walk in it's as though you are on a tropical island. It's one of the Disney World resorts that is on the monorail route. It lets you out on the second floor. The Polynesian show takes place in the courtyard outdoors. The food court here has tropical themed food and there are plenty of outdoor seating to help you soak up the sun. When it comes to breathtaking Disney World resorts this is it. Many of the rooms overlook the Savannah so guests can view the animals easily. The whole place is designed to resemble an Africa resort. Walls are of dark carved wood, the retail store sells hand crafted items from Africa, there is a restaurant and lounge. It's one of the few Disney World resorts with a restaurant that is open to the public. Boma; Flavors of Africa one of the most unique dining experiences on the property. This may be my favorite place to stay. It's the only one of the Disney World resorts to have a campground. Cabins that can sleep families are available. There is a restaurant, food court, pool, canoes, hiking trails and even horseback riding. Like the other Disney World resorts it offers that famous Disney transportation. In fact, I think it's the easiest to transport from. All guests have to do is take the ferry across the lake. It lets you off at the Ticket and Transportation Center. From there you can go to any of the theme parks. This makes it one of the most convenient of the Disney World resorts.